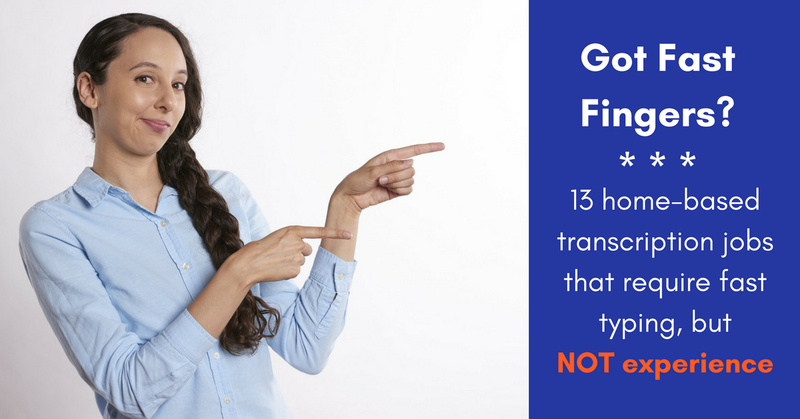 13 Transcription Jobs That Require Speedy Fingers, but NOT Experience! In response to the many requests we get from people who would like to get involved in work from home (WFH) transcription, but who don’t have experience or training in the field, we have gathered a list of companies that work with speedy, but inexperienced typists! No state hiring restrictions, either, for most of these jobs. Please visit each site and read through their job qualification details. For more jobs like these, check our Newest Jobs & Gigs page. To be the first to hear about WFH jobs like these, like our Facebook page. Good luck in your next steps toward working from home! This entry was posted in Earn Extra Cash, Transcriptionists (Non-medical), Work at Home Jobs. Bookmark the permalink.